An inquiring mind :: Ken Alexander ’82, chief of pediatric infectious diseases at the University of Chicago’s Comer Children’s Hospital. :: In Season: What about buckwheat? Soldiers of Paint by Doug Gritzmacher ’98 and Michael DeChant Jr.
A model of one of the students’ projects. Last fall 10 Washington State University architecture students wandered into Seattle-area backyards to work with the notion of the backyard cottage. 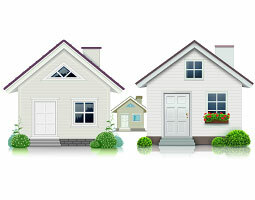 In Seattle, they’re called DADUs or detached accessory dwelling units. These spaces could be homes for older family members, rentals for college students and others on a tight budget, or just homes for folk seeking a small dwelling in a big city. Such structures were approved by the city in 2009 and have been options in communities all around the Puget Sound including Redmond, Shoreline, and Clyde Hill. Because of the high demand for low-cost housing, the Seattle City Council anticipated a flood of permit applications for these backyard cottages. Instead, fewer than 100 permits have been issued. 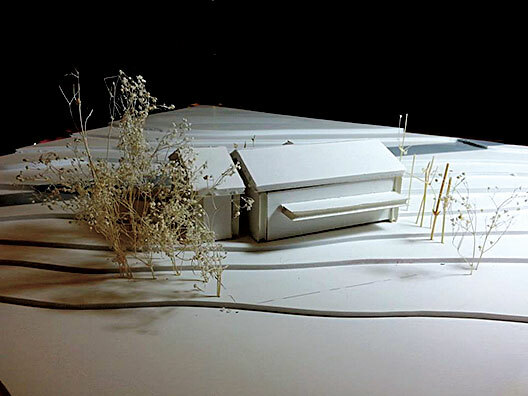 At the urging of a Seattle architect, associate professor Taiji Miyasaka had the students take this DADU idea and blend it with the need for transitional dwellings for the homeless. During a recent survey, the Seattle/King County Coalition on Homelessness counted more than 2,500 unsheltered homeless people on a particular night and another 8,000 in shelters. Another study, conducted by the City of Seattle, showed that a large portion of the homeless people surveyed said they would pay a monthly rent of $200–$400 to get off the streets. The ideas of DADUs and affordable homes for the homeless came together. 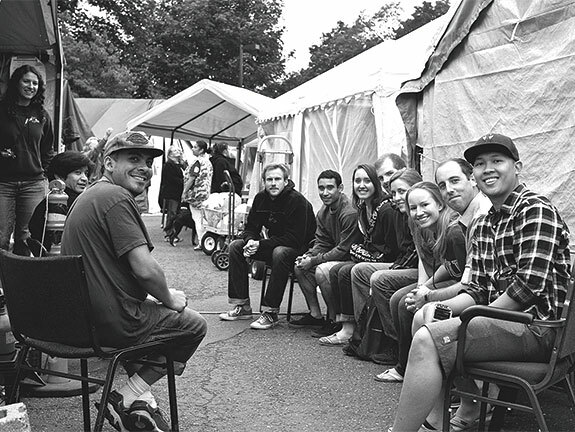 To focus on the primary experience of their potential clients, the students moved into Seattle’s Tent City 3 over a three-day weekend early last fall. The residents were more than happy to show them how to live there. “All they wanted to do was help us,” says student Cassie Lang. “It was surprising to see how structured the camp was, how many rules there were,” says Shannon Coughlin. When night came, the students slept on crates covered with cardboard in one big tent, hearing the noises of the camp. Once they were awakened by an ambulance that had come to help someone with a diabetic issue. “It was quite an adjustment to go home [to Pullman] and it was quiet and I could hear crickets,” says Marissa Cool. The project drew a mixed response from the potential clients. The residents who hadn’t been at Tent City 3 for long were intrigued, but the long-timers were reluctant to leave. A few said they’d move if they could find a place out of the rain, maybe with a small sink and a toilet and an area to prepare their own food. Their projects designed over fall semester, the students returned to Seattle in late November to present them to architects and designers at The Miller Hull Partnership. Working with two different sites the students sought to design structures that were both stylish and affordable. They also had to follow building codes and a guideline keeping the construction to 150 square feet or less. Normally people spend an average of 72 minutes a day outdoors, students Coughlin and Ryan Rideout noted in their presentation. The homeless are often outside 24 hours a day. Moving inside would take some adjustment. That’s why the pair incorporated a garden into the design, as well as an outdoor kitchen space that made use of the plumbing on the exterior wall of the house. Then they tucked a single room “home” under a second-story deck. The room could be an open space with a chair and table and a bed that pulled down from the ceiling. The sites offered different opportunities. Seattle architect Rex Hohlbein ’81, who has been putting his energies into finding items like coats and sleeping bags and meeting the urgent needs of homeless individuals, offered his Capitol Hill home as the urban option. It has a small yard, is built on a steep slope, and has a number of close neighbors. Cassie Lang concentrated on one particular client, a man named Arthur who spends a lot of time riding his bike and repairing bicycles for the other tent city residents. Lang focused on converting Hohlbein’s existing garage, turning the rafters into a sleeping space and designing an area facing the alley that could be turned into a covered work area. The second site was north of Seattle in the more suburban neighborhood of Shoreline. There the students had a much larger yard that already had an outbuilding to work with. To save expense and use available material, Steve Schmitz chose wooden pallets as the framework for his walls and floors. He designed a single-room unit that could tuck under the metal roofed shed in the Shoreline backyard. “It’s already pretty sheltered,” he says. And one of the requirements was that it could be fairly easy to dismantle and relocate if the owner moved. When the students visited the Shoreline home, they arrived in a university van and poured into the yard, taking photographs and making measurements. Their actions were interesting enough to lure the neighbors. As the students explained the project, the neighbors started sharing their own stories. One even said that he, too, had been homeless for a time.